Romance comics are due for a resurgence. Appearing only occasionally since their heyday in the 1950s, romance is a genre that has flitted around the margins of American comics for the better half of a century, but Rosy Press, in a collaboration with Oni Press, is committed to revitalizing the form. Here in Fresh Romance Vol. 1 (Rosy Press & Oni Press) are a few recent examples of the genre, and they demonstrate the difficulty of working well in that idiom. 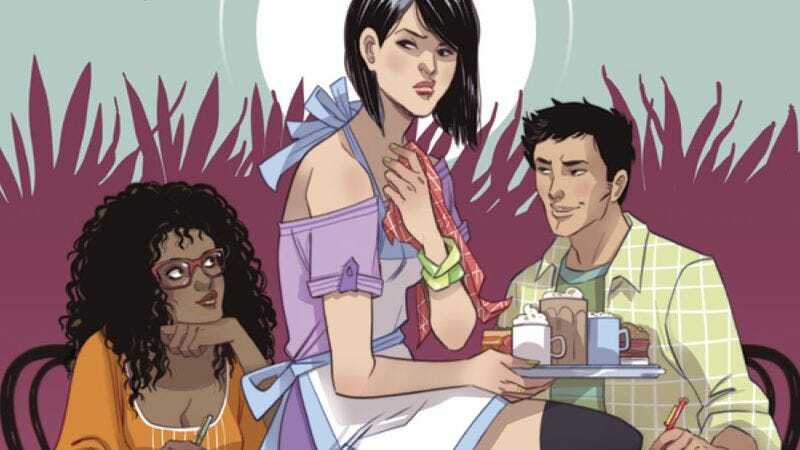 Collecting five stories (a couple of which were reviewed by this very site) from the first several issues of the Fresh Romance comics magazine, this first volume offers both compelling and stumbling examples of romance. Across the five stories, the most prominent and recurrent issue is question of pacing. For the most part, these stories—particularly Kate Leth and Arielle Jovellanos’ “School Spirit” and Sarah Kuhn and Sally Jane Thompson’s “The Ruby Equation”—feel long. They are rich in character, detail, and plot. In fact, they are too rich. Constrained by their limited space, they overflow, resulting in a rushed, truncated pace. The function of the story doesn’t simply turn on these relationships being compelling; the whole of the story is simply these relationships. Without the space necessary to tease them out, build them, fill them with endearing details, and texture them with the wrinkles that enrich them, these relationships are weak. As a result, the stories are weak. This weakness is felt in other ways as well, and the overly frequent, inconsequential inclusion of magic and fantasy in these stories belies a lack of confidence in the romantic qualities of the story. This inclusion of fantasy elements is ironic, given that it is fantasy that gives life to the romance genre itself, that is, the fantasy of a life unlived, a thirst unquenched, or the daydream of a person or people who has/have been declared unworthy of love. The witches and otherworldly beings, at least in the tacked-on way they are included here, have the incidental effect of distracting from the underlying fantasy, robbing it of its power. It becomes about the sorcery instead of the negotiated passion, or the exposed emotions, or the wish fulfilled. Conversely, “Beauties” by Marguerite Bennett and Trungles offers a sketched romance full of magic and fantasy, underscoring the preceding stories’ flaws. Styled like a fairy tale, “Beauties” is constructed mostly in succinct and expository captions and striking, affirming images. Trungles’ flat, divinely textured images reflect and confirm Bennett’s narration—this doubling up of narrative functions as a call-and-response, proposition and substantiation, and it sells you on otherwise-cold text. Bennett puts her trust in her collaborator, and this trust pays off, allowing them to move briskly and confidently through their story. The result is a vignette that feels much fuller and substantial than its companion pieces, though it is no longer. What’s more, the elements of fantasy are treated as allegorical symbols rather than plot mechanics; they underlie and help make clear the romance, rather than obscuring it. Something must be in the water these days, with the number of all-female bounty hunter comics coming out at once. Hot on the heels of the excellent Kim & Kim, Bounty #2 (Dark Horse) takes advantage of some of the same plot devices and characterization as the other book, but forges off on its own. Bounty tells the story of two sisters who were forced to abandon a previous, more profitable criminal career in favor of a legitimate one as bounty hunters. Between their jobs and the composition of the crew, it’s tempting to compare Bounty to Cowboy Bebop, but unfortunately it has less charm and subtlety than the anime. Billed as “Rat Queens meets Firefly,” Bounty certainly has more in common with the former than the latter, and no real surprise given that Kurtis J. Wiebe is the writer for both. Sisters Nina and Georgie are joined by tech wiz Vivian and Georgie’s sort-of buzzkill of a husband Alan in this second book. They’ve been forced to give up their previous identities and demonstrate remarkably bad luck in catching bounties, exacerbated mostly by a lack of forethought by Nina. It’s a foursome that really does chart neatly to parts of Cowboy Bebop, right down to Vivian’s build and the fact that she has a pet. But Bounty suffers from many of the same issues that Rat Queens does, especially in the first two issues: Each character’s personality is amped up so high as to become a caricature instead of an interesting portrayal, and Nina’s penchant for punching everything instead of actually making an effort to keep herself or anyone else safe gets old fairly quickly, to say nothing of Alan’s long-suffering dutiful husband bit. Mindy Lee’s art is absolutely the biggest draw of the book. She’s got a style that’s Babs Tarr meets Faith Erin Hicks, and it’s a great fit for the tone of the book. Leonardo Olea’s colors are neon pop, and it makes the art vibrant and dynamic, sort of a Fifth Element on what the future will look like: filthy but colorful and bright. It’s not clear who made this choice, but in order indicate which off-panel character is speaking over the radio the speech bubbles include a small chibi icon of the speaker, instead of relying on text or word ballon color to differentiate; it takes a little adjusting to get used to, but Nate Piekos’ lettering is clean and crisp enough to accommodate that choice pretty easily. Cartoonist Jeffrey Brown has had a fascinating career trajectory. He made a name for himself with autobiographical slice-of-life comics exploring his personal relationships and his neuroses surrounding them, but his output over the last few years has skewed toward all-ages comics with a heavy dose of fantasy. He’s spent most of the last four years working on licensed Star Wars books (the Eisner Award-winning Darth Vader And Son and assorted sequels, the Jedi Academy series), but Brown is launching his own kids’ property with Lucy & Andy Neanderthal (Random House Kids), a series that combines comic hijinks with facts about Neanderthal life. Those facts are the foundation of the Neanderthal siblings’ heavily fictionalized experience, and even though Brown puts these characters in a more traditional narrative framework, their story feels fresh because of how it’s shaped by Neanderthal reality. The book is definitely intended for a younger audience, but fans of Brown’s previous work will find plenty to enjoy in his humorous approach to the educational material. Focusing on the interpersonal dynamics of Lucy and Andy’s clan provides an emotional anchor for the story, and getting the reader invested in the character relationships makes it easier for Brown to teach them when it comes time to present factual information. This first book is a lighthearted introduction to these characters and their prehistoric world, but it ends by teasing a conflict that considerably intensifies the drama going into the second volume. It will be interesting to see how Brown approaches the intersection of Neanderthals and humans as the series continues, and this meeting of two species gives Brown a lot of options in regards to the educational content he chooses to present in the next book. One of the standout moments of this title is the chapter about cave art, in which Lucy reveals her talent for cave drawing and is immediately greeted by criticism from her clan. Brown uses this scenario to poke fun at art criticism, and it’s very possible that Brown is reacting to critiques of his own recent work in this sequence. Comparing Lucy & Andy Neanderthal to Brown’s earlier work shows just how much he’s grown as a cartoonist, but there are always going to be those people that preferred the looser style of his past work. This book isn’t made for those readers, though, and Brown’s style has evolved in a way that makes it an especially good fit for children’s stories: simple enough that kids can replicate it fairly easily, but with an attention to detail in the characterizations and environments that makes the storytelling exceptionally clear.